Make your own nachos. So easy and absolutely yummy! Cook the onion in a frying pan until it has softened a little. Add the minced meat. Cook for 3-4 minutes. Add the salsa sauce and beans. 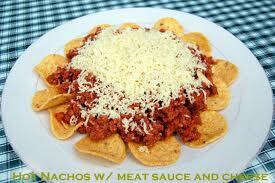 Serve the mixture with nacho chips and add the sour cream and cheese at the end.